Consumers Energy encountered two surprises this year after it fast-tracked a Michigan wind farm project to take advantage of expiring federal tax credits. One, the project will cost less than the utility thought it would to build, and two, technology advances mean each turbine will produce more power than previously projected. Citing those improved economics, Consumers Energy proposed last week to eliminate a surcharge on customers’ bills that was designed to cover the cost of complying with Michigan’s renewable electricity standard. The utility is downplaying the significance, but environmental groups are claiming a win, saying the proposal vindicates their position that utilities have exaggerated the cost of renewable energy. “The accounting is finally catching up to facts we’ve always known, which is that renewable projects have been cost effective, and they’re getting more so,” said David Gard, energy program director for the Michigan Environmental Council. While it’s difficult to generalize about the rate impact of renewable energy standards, the experience of Michigan’s large utilities suggests they aren’t always as costly as critics claim. Michigan’s 2008 renewable energy law requires all utilities to generate 10 percent of their electricity from renewables by 2015, and it lets them pass the added expense to customers in the form of a monthly fee. Consumers Energy had already cut its monthly renewable surcharge in each of the past two years. In 2011, the utility adjusted it from $2.50 to 65 cents, and last year it was lowered again to 52 cents. On July 29, the company filed testimony with the Michigan Public Service Commission in which it proposed phasing out the renewable energy surcharge completely. 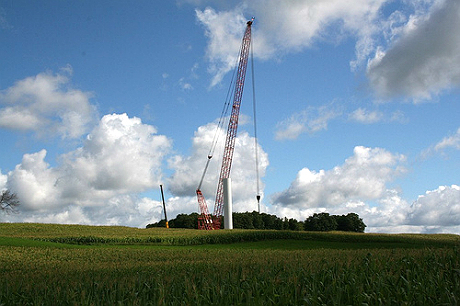 The July 29 filing focuses on financial developments around the company’s Cross Winds Energy Park, a 62-turbine, 105-megawatt wind farm to be built in Tuscola County, in Michigan’s thumb region, south of Saginaw Bay. Consumers planned to spend approximately $275 million on the project, but the price tag for equipment and construction has since fallen to about $265 million, the company said. By moving the project schedule up a year, the company will also qualify for approximately $110 million worth of federal wind production tax credits over the next decade. Meanwhile, the projected net capacity factor — the amount of time the turbines will generate power — has improved from 41 percent to 45.2 percent because of better turbine performance. The disclosure from Consumers Energy comes just two months after Michigan’s other major electric utility, DTE Energy, proposed lowering its monthly renewable energy surcharge from $3 to 43 cents. Michigan environmental groups thought the surcharges were too high from the beginning and are pleased with the utilities’ proposals to significantly lower or eliminate the fees. “The utilities weren’t excited about having to do renewable energy. They thought it was going to be expensive and didn’t want to have to do more. It turns out, they’re finding that it’s been good business. It’s good for customers, it’s good for the company, and it’s good for investors,” said Tiffany Hartung, a campaign organizer for the Sierra Club’s Michigan chapter. Dan Bishop, a spokesman for Consumers Energy, rejected that interpretation and instead described the company’s surcharge proposal as primarily an accounting change. Bishop said he could not say whether other portions of customers’ bills would go up or down under the proposal. He also noted that by the end of the year the company will have collected a surplus of about $200 million from the surcharge to cover ongoing compliance costs. Regardless, the shrinking surcharges show the utilities’ projections about what ramping up renewables would cost were also not accurate. The reality is that the rate impact of renewable electricity standards across the country has been mixed, varying from state to state and utility to utility, but mostly modest. A 2012 report by the Center for American Progress found that of 22 states where enough data existed, 12 saw electricity prices increase at a slower rate, relative to the national average, after they adopted a renewable standard. The Sierra Club and Michigan Environmental Council are members of RE-AMP, which publishes Midwest Energy News.